If you are not including the "Basic Math Series" in your order, we suggest you include our "Algebra Basics" (Pre-Algebra) program in your Algebra By Chapter bundle -- perfect for those students who need learn the pre-requisites or to brush-up before beginning their comprehensive study of algebra. (A $49 value for only $10 when purchased with the 8-chapter set of the "Algebra By Chapter Series".) We believe pre algebra is necessary for learning algebra properly and thoroughly. 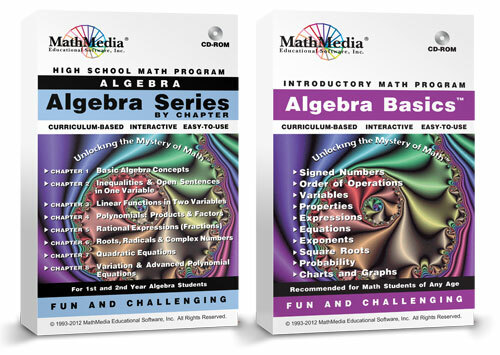 Learn algebra in this systematic algebra software program series, chapter by chapter. For comprehensive descriptions and sample screens, click on the "Algebra Software" menu button on the upper left of your screen.